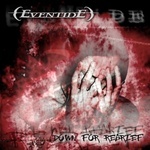 Eventide is a melodic death metal/progressive metal band from Stockholm, Sweden. 1998: The original line-up takes form and consists of Jacob Magnusson (Guitars, Vocals) Niclas Linde (guitars) Åke Wallebom (bass) and Max Seppälä (drums). Rehearsals begin on a weekly basis. 1999: The band finally have enough money (and songs) to record their first demo-cd "Caress the abstract", a five-track rocker recorded during 7 days at Los Angered outside Gothenburg. The Cd is sold through the website to almost 300 fans from various corners of the world (e.g Taiwan, Japan, Australia, U.S, Canada, Germany, Italy and many more). 2000: Another demo is released, but still broke from the money-devouring first demo, the band can only afford to release the three new songs in mp3-format. The idea was not to sell this one, but to burn Cd's and send to record labels and magazines, hence the name "Promo 2000". The band is invited to open for In Flames on the release party of their Cd 'Clayman', but someone fucked the booking up so the whole thing was re-arranged in Gothenburg instead of Stockholm, where it was initially being held. 2001: Two demo's and still no record contract put a strain on the bands creativity, and despite 15 hrs of rehearsals each week things moved very slowly. Åke Wallebom decided to leave the band and a few new members came and went (a guitarist, a bassist, a keyboardist), but the biggest problem lay in the song writing. There was a lot of experimenting, and finally the new sound differed so much from the original two demos that the band decided to take a break and figure out what to do. 2004: December. After three years of hard work with a different band, and three years of people STILL sending e-mails wanting to buy 'Caress the Abstract' and 'Promo 2000', Eventiders Jacob and Max decides to record a third Eventide demo. If not for fun, then atleast for the fans still hanging in there. Their newly built studio could not have served a better purpose. 2005: The writing begins in the first week of January 2005 and is recorded almost immediately.Thomas Magnusson, Jacobs brother, joins the band to play bass. Another good friend, Jonas Sjölin joins in to play the guitar, and the band is rehearsing for the first time in 4 years. Unfortunately, Jonas has to quit shortly there after due to personal reasons. 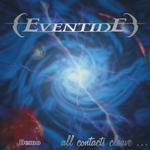 In the meantime Max contacts a record label that wanted to sign Eventide in 2001, to see if they're still interested. Discussions goes on for half a year but in the end, the band decides it's better to press the demo themselves and sell it to the awaiting fans, just like they did with 'Caress the abstract' in 1999. Eventide is also Jeremiah Soto's and lifetime musical partner Dann Torres' group. They recruited the talents of Laura Grissom on bass and Julie Blodgett on vocals. Influenced by bands like Dead Can Dance, Cocteau Twins, and various classical composers, Eventide experimented with fusing Medieval and Middle Eastern music. In the process, Jeremiah realized his fascination and talent for Middle Eastern drum rhythms. To better his knowledge, Jeremiah attended classes in Frame Drum, Conga, and African polyrhythms by world-renowned percussionist Ronnie Engle. Unfortunately, after several releases on various compilations and countless live performances, Eventide disbanded in February 1995.